The bulky, two-volume edition of "Hitler, Mein Kampf – A critical edition" is sold in Munich, Germany. Commentary is added in an effort to point out Hitler's propaganda and mistakes. 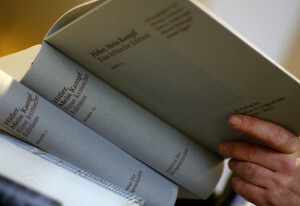 The bulky, two-volume edition of “Hitler, Mein Kampf – A critical edition” is sold in Munich, Germany. Commentary is added in an effort to point out Hitler’s propaganda and mistakes.